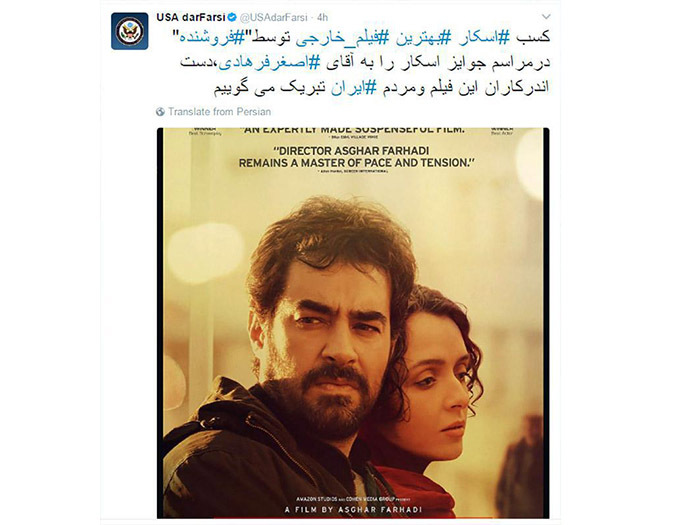 The US state department deleted a congratulatory message for an Oscar win by prominent Iranian filmmaker Asghar Farhadi who had criticized President Donald Trump’s travel ban as “inhumane”. However, it later removed the tweet “to avoid any misperception that the USG [US government] endorsed the comments made in the acceptance speech,” according to a US State Department spokeswoman. A second state department official said the decision to delete the tweet was made within the department. Farhadi boycotted the Oscars ceremony and issued a statement criticising Trump’s January executive order that temporarily banned entry to the United States by Iranians and citizens of six other Muslim-majority countries. The ban was blocked by federal courts, although the administration has said it is working on a new order, The Guardian reported. Farhadi chose two Iranian-Americans – a female engineer and a former NASA scientist – to represent him at the ceremony. Anousheh Ansari, an engineer who was the first female space tourist, read a statement on Farhadi’s behalf calling the travel ban “inhumane”.